Granny and Jed? Jethro and Ellie Mae? This wouldn't even raise an eyebrow in Flathead County. 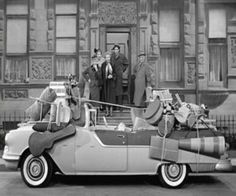 Fred Mertz taught this guy everything he knows about packing a car. A trailer would have been cheaper and safer than the ticket and the tow. I once saw a pickup with a homemade camper back packed like this in Alaska, evidently trying to drive south. The police didn't stop it in the middle of the road in the middle of nowhere; a broken axle did. I saw a Dead Head sticker on a mini-van". "Don't overpack, you can never overpack." "Sorry folks, we're closed! Moose out front should have told you." I saw this episode of Hoarders on the Road. A lot of feces and urine were found in the glove box laying next to the PCP. MOTW beat me to it. That was my immediate thought too. Now I can't get "The Ballad of Jed Clampett" out of my head. WOW! We're like a really terrible version of a Don Henly/Slim Whitman song writing duo. The best! Doug and Head_Smashed ! I just love that one of the pics shows them loading it on to a flatbed truck to take it away. Doesn't that compound the problem?